This crime should remind us tragically that the words always precede actions, that words – the discourses of hate, exclusion – can lead to the irreparable. Brahim Bouarram, Ibrahim Ali, Imed Bouhoud, Ilan Halimi and many others have paid their life for the freedom of racist speech. The communiqué ends by an appeal for vigilance and civic resistance. And from here this blog post could take many directions. I’d like to write about this typically French habit of appealing to the duty of the citoyens, MRAPs interesting – and in my opinion laudable – position and (lost) court case in the Mohammed caricature incident, the sombre and complicated issue of racially motivated murders, the recent media appearances of de Villiers (speaking of an islamisation of France and the need for a francisation) and of course this “build-up of violent speec” (violence des propos racistes s’exprime dans une surenchère). The latter issue I’ll expand on very soon in a post with the catchy title Liberté, Égalité, tes papiers! (stolen from an anti disposable immigration flyer). The present post shall however continue recounting 1st of May, as I experienced it. 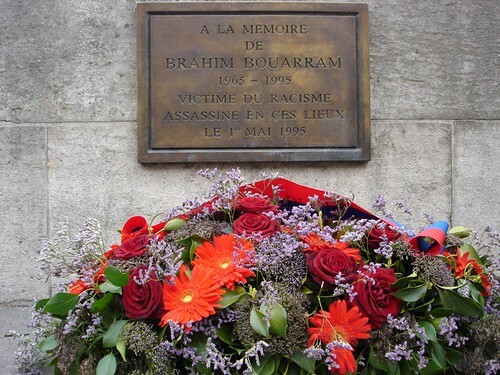 Three years ago, at the moment the commemorative plate for the murdered Brahim Bouarram was inaugurated by Major Delanoë (see this article from 2003 on Paris Indymedia (in French)), Le Pen used (according to the media) the occasion to make an ironic remark on a nearby gathering: “That bridge will soon resemble our great religious sites, because it seems that every year a commemorative plaque will be put up to thank the little hoodlums petits voyous who every year allow themselves to slander the Front national.” (I’ve found other quotes as well from Front National concerning this event, which I don’t think should be forgotten). (I haven’t yet looked into the relationship between FN, Jeanne d’Arc and the 1st of May, see Wikipendia (in French)). As I don’t look like an Arab (which was the unfortunate fate of Brahim Bourram), I thought it safe to go and have a look at this procession. However, I didn’t and as this is such a sombre subject, I’ll not make a joke about why it turned out that way. This blog post was supposed to be about 1st of May, but I’ve already written almost two pages about the far right. For my part, the 1st of May celebration ended on a happier antiracist note with “rock against Sarko” by a classical French punk band at Place de la Nation. But before I wrap it all up with that story, I shall say a few words about the other processions I missed that day, just to give an idea of the things going on in Paris on mayday. First, I missed when one of the major labour unions (La Force Ouvrière) put flowers on the Communards’ Wall (Mur de Fédéres) at my local cemetery, the Père Lachaise. Then in the afternoon, I missed half of the major procession going from Place de la République to Place de la Nation. (I though the procession would pass by Bastille, but they went the straight axis République – Nation via Boulevard Voltaire (surely no unintentional symbolism here- I’ll come back to this symbolic axis of republicanism later, in which I think also Quilombo (the libertairian bookshop situated in rue Voltaire) has its place – I’ve just learnt that Quilombo was the name of antislavery settlements in Brazil, and Voltaire deserves a little reminder of the history of antislavery movements… I’ll maybe write why at a later occasion)). The last event I missed, I skipped by my own choice, although I regret it a little now. 2nd of May the temperature returned to over 20°, but it was really chilly, grey and rainy on the 1st (and even worse the day before when I skipped two street parties; one for some sans-papiers families ejected from a squat and who now lives in a square, another just locally in Ménilmontant). The Euromayday organises Mayday parades all over Europe, and the phenomenon shows amongst other things the rapid dispersion of ideas, in this case counter movements, through the internet. Suddenly precarity has become a word in English (se a US-American blog post on this and the interesting recent Wikipendia entry), and even in Norway some left-wing radicals have adopted the notion of a génération précaire, stemming from the CPE-movement in France. 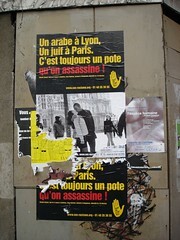 (In January when I wrote the post on insecurity à la français this was not yet the case). But as I’m – and maybe eventual readers as well are – getting a bit fed up by this text now, I’ll end here. We’ll probably have the chance to delve into French punk concerts, the internet and protest movements and what else, later. I’m already preparing the part three of My blog, my project and I, - this time on… oh, yes, as always these days… politics and I.